Here is the code to create and initialize a perspective camera. The camera is the core element of the viewing pipeline and we need a perspective camera to see the 3D world. The camera has a field of view (fov) of 60 degrees and its position is X=2, Y=2 and Z=4. That’s all for the triangle. More parameters to customize the grid have been covered in THIS ARTICLE. We live today in full shader world so we need a GPU program to draw (render) 3D objects on the screen. To draw both the triangle and the grid, all we need is a GPU program that can deal with the position and color of objects vertices. This GPU program has a vertex shader to transform the geometry (the vertices) and a pixel shader to draw the pixels of the primitives (here a triangle and lines). Remark: I used the version 130 in this GLSL program because it’s supported by any OpenGL 3.2+ implementation but and that’s the important thing, it’s supported by some Gallium drivers on Linux. Those drivers do not support OpenGL 3.2 (version 150) but only OpenGL 3.0 (version 130). A good example of such a driver is the default driver that is installed with Linux Mint 17 when a NVIDIA GeForce card is present. 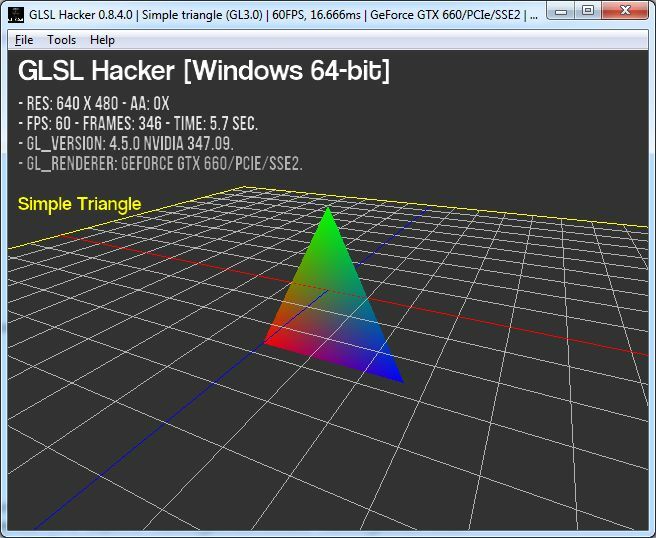 The demo is available in GLSL Hacker GeeXLab code sample pack in the host_api/Triangle/ folder. You can download both GLSL Hacker GeeXLab and the code sample pack from THIS PAGE. The demo is available in two flavors: GL3 for desktop systems (Windows, Linux and OS X) and GLES2 for the Raspberry Pi.